Auckland Sinfonietta was founded in 2016. The musicians in the orchestra live in the Auckland area. The goals of the Sinfonietta are to promote orchestral repertoire and variety of music and present it to local audiences. It also seeks to nurture and present music of different ethnicities in an effort to promote multiculturalism and therefore enrich our society’s tastes and appreciation. By doing this it aims to establish a niche in the Auckland orchestral scene that is currently not filled by the other orchestral bodies in Auckland. Recently appointed as Concertmaster of Orchestra Wellington, Amalia Hall has received widespread acclaim for her ability to move audiences with her "sumptuous and sweet tone", inherent musicality and natural facility. She has won five international competitions and has received laureate prizes at numerous others, including the Joseph Joachim, Premio R. Lipizer and International Tchaikovsky Competition for Young Musicians. While still in her teens she won all of the major national awards in New Zealand, including the Gisborne International Music Competition at the age of 16, the National Concerto Competition and National Young Performer of the Year. 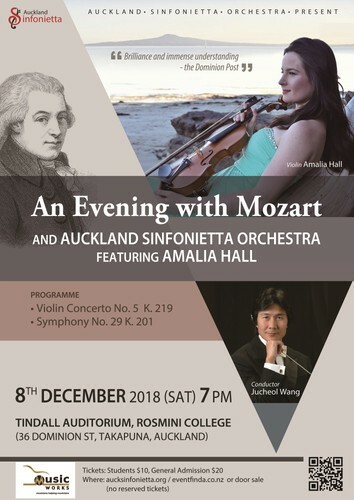 Since making her debut at the age of 9 with the Auckland Philharmonia, Amalia has been a regular soloist with orchestras in New Zealand, and has made solo appearances with orchestras in Europe and Mexico including I Virtuosi Italiani, Munich Chamber Orchestra, NDR Radiophilharmonie, Filarmonica Marchigiana and Mexico State Symphony Orchestra. Her extensive performing experience includes performing concerti, recitals and chamber music throughout Europe, USA, South Africa, China, Mexico and NZ; touring for Chamber Music New Zealand, Curtis on Tour and as a member of the NZ Chamber Soloists; and recording chamber music for Bridge Records and Atoll Records. Amalia has held teaching positions at the University of Waikato and has given masterclasses at universities and conservatories in Italy, England and Mexico. Born and raised in New Zealand, Amalia then studied at the prestigious Curtis Institute of Music with Pamela Frank and Joseph Silverstein. Prior to his arrival in New Zealand, Wang was the founder, director, and bassist for the Seoul Uniss chamber orchestra. Wang has been an assistant conductor at University of Iowa Philharmonia Orchestra and conducted Seoul Women’s University Orchestra and Korean Philharmonic of New Zealand. He has also served as a jury member for several major music competitions including the Vienna International Music Competition in Austria, Music Journal Competition and Kookmin Ilbo Competition in Korea. As an educator, Wang has taught at Kun-san National University in Korea, Univ of Iowa, Clark High School and Armstrong Middle School in Texas and he has published the Method Book for the beginner in Korea which is the first book written by a Korean. His qualifications include a Master’s degree in orchestral conducting and a doctorate degree in double bass performance from University of Iowa and Master’s degree from University of North Texas in U.S.A. Chung-ang University in Seoul Korea (BMus). Recently, he conducted the Seoul Uniss Chamber Orchestra’s 20th anniversary concert in Korea. Wang is the head of music at Rosmini College as well as the president of the Music Association of Korea in New Zealand.